Hasbro Toys just hosted a San Diego Comic-Con panel to talk about their plans for the upcoming year. Hasbro, of course, had a major summer last year with Michael Bay’s Transformers moving to the big screen right from their toyline. In addition to next summer’s Transformers sequel, Hasbro looks to repeat their success by launching their another major property as a live-action film with G.I. Joe: Rise of Cobra. Before talking about the feature film, footage was screened from an upcoming animated web-series inspired by the ’80s cartoon series and the long-running Marvel comics. Tilted “G.I. Joe: Resolute,” the series is planned as a 60-minute movie, split into five-minute segments to air first on the web and to later be collected on DVD. Written by comic book legend Warren Ellis, the series’ look and feel is an update on the ’80s designs with a definite anime quality (producer Joaquim De Santos said that “Ghost in the Shell” was a major influence). Ellis, who wasn’t able to attend, sent the audience a message via De Santos that he’s in England, sitting in his living room, naked, collecting all of Hasbro’s money. The footage — the same footage screened last week at Joe-Con — showed a jungle attack and some decidedly PG-13 violence courtesy of Snake Eyes. When one of the Joes exclaims, “I didn’t know we had a ninja,” the screen flashed G.I. Joe’s trademark, “NOW YOU KNOW”. Moving on to the live-action Joe, film consultant Larry Hama (who also has a cameo as a General) talked about how he came onboard to maintain the feeling of his famous comic book run. 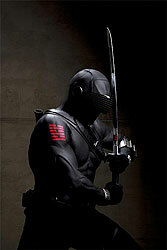 Of Hama’s involvement, producer Lorenzo di Bonaventura laughed saying, “We wanted to have Snake Eyes say one line. He made sure we didn’t.” This, of course, was met with much applause from the audience. Lorenzo went through images of the cast (the same images we’ve seen on the posters) and talked a little about each character, going into their personal history. When the film begins, none of the characters are Joes and are enlisted through the course of the plot. Duke and Baroness were paired together on-screen as their history is one of the major relationships of the film. Once engaged, Duke left the Baroness at the altar and they now find themselves on opposite sides of the battle. Marlon Wayans (who was cast because of his performance in Requiem for a Dream) has a humorous relationship with Scarlett who is completely oblivious to his advances. Lorenzo stressed, though, that it was important to have a dramatic side as well, especially since it becomes a triangle with Snake Eyes. Storm Shadow and Snake Eyes are featured in the film early-on as ten-year old kids, exploring their rivalry from a very early age. A few stills were shown, including one of the epic-looking MARS base set in the arctic. Lorenzo promised action on a global scale as the film has a larger budget than the first Transformers. De Santos explained that there are only four big action scenes but that we’ll all be blown away by exactly how big they are.